I like parties because they give me the opportunity to make appetizers that I would otherwise never make, and the chance to make cocktails and serve them in my glass pitcher. That’s not the only reason, but it’s a big reason. And one day, I hope to be truly fabulous and do some really fantastic table settings and coordinating decorations. Here are a few things to inspire you for your next party. 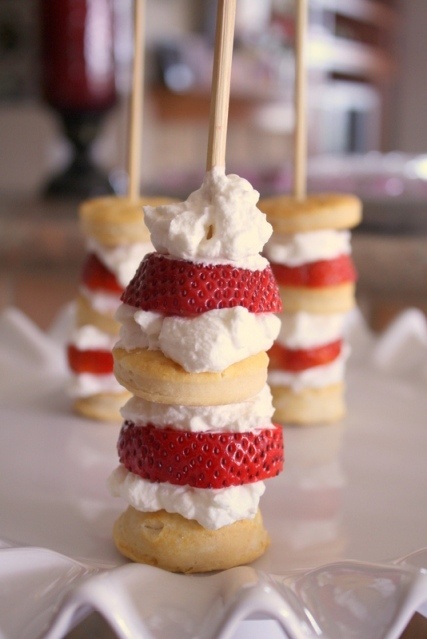 How cute are these mini strawberry shortcake kabobs? These would be a dessert hit for sure. Here’s a punch recipe that sounds delicious to me, and I think it would be very inexpensive to make. Those two reasons make it the perfect drink for a big party. I live in Arizona so margaritas are plenty and a must. Here’s a mango-raspberry margarita that would be perfect for summer. I try not to eat dairy, but how do you resist a cheese platter? And, people at parties always like cheese. Sure, when we were in college, drinking was enough of an activity to entertain us, but these days, I’m starting to think sometimes it’s nice to have a group activity at a party. If you’re fabulous enough to have a large, empty space in your home, and a little extra cash, why not build your own home theater, as pictured above? If you’re not in Arizona, maybe it’s not 100 degrees outside at 6 p.m. If that’s the case, then your guests will probably enjoy this backyard Scrabble game. And giant board games are so cool looking. And this is a giant tray of jello shots. I included these because I got a little nostalgic when I saw them. Sarah Michelle and I used to make a lot of jello shots.